Visibly transforms skin in 8 days. Is hydralock moisturising milk for me? Yes if you have normal to dehydrated skin that, at the times, becomes dull and lacks softness. To transform into beautifully dewy skin, it needs non-stop moisture. 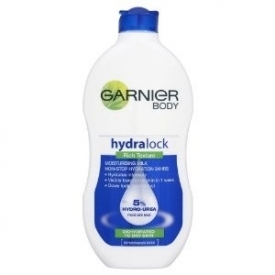 Its formula contains 5% hydro-urea a naturally-derived ingredient. It works in perfect harmony with your skin, which is why it's so effective at intensely hydrating. Non-stop all day long. Results: Transforms the look of skin in 8 days. Instantly: Skin is rehydrated and replenished. In 8 days: Skin looks transformed. Intensely cared for your skin is better able to retain moisture. Skin looks dewy and feels supple all day! Naturally derived ingredients, which have been carefully extracted to preserve quality and purity. Have been formulated and dermatologically tested to ensure their effectiveness and respect for your skin. Bottle is great, easy to use, absorbs really well, price is amazing, skin is noticeably better after a few days use. Although it is slightly watery, it does get into the skin very quickly and you do not need loads either as it is very good. Skin feels great and after a few days skin is noticeably more hydrated. Does not leave skin greasy or covered in a film, as it is absorbed really well.